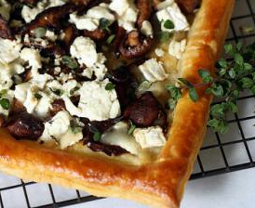 Truffle Tremor® and Shiitake Mushroom Tart - A recipe from Savor California, the online showcase for extraordinary gourmet foods and beverages from California. Sauté minced shallots and butter in medium sized sauté pan on medium-high for about two minutes, until brown and crisp. Add the mushrooms and olive oil. Sauté on medium, stirring occasionally, for about 10 minutes until lightly browned and mostly dry. Remove from the heat and allow to cool. Line a baking sheet with parchment paper. Lightly flour the paper. Unfold the dough onto the baking sheet, gently straighten and make even. Using the tip of a knife, gently score a 1 inch square border on the pastry sheet without cutting all the way through. Using a fork, pierce the dough inside the square frame (not the border), in multiple spots. Using a pastry brush, brush entire top of pastry with egg to add a nice sheen to the crust and to create a moisture barrier for the other ingredients. Bake the tart for 15 minutes in the center of the oven. Remove from oven and use a fork to gently flatten down any puffed areas. Spread sautéed mushrooms and chopped Truffle Tremor® evenly across the sheet and bake for an additional 10 minutes. If the pastry begins to look too brown, add a foil tent over just the crust area of the puff pastry. Remove from oven, sprinkle with fresh thyme leaves. Add a light dusting of freshly grated nutmeg, if desired. Serve warm.